This weekend we will be undertaking another of our trail building days – these are always good fun and give you plenty of good karma, so come along and be part of what makes this club great! WHEN: Sunday morning – 1st July at 7:30am. WHERE: Meet in the main carpark at Awaba. WHAT: This will all depend on the numbers that we get attending. We hope to be able to commence clearing some new areas in an ‘elevated’ section of the park as well as some work on the XC trail network. WHO: Everyone is welcome! 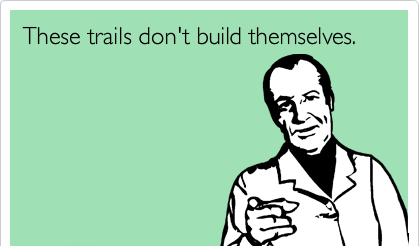 As the picture says, these trails don’t build themselves so if you ride in the park then come along and put something back in. Digging tools – metal rakes and McLeods.